On Tuesday evening, Kathryn Sheridan, Zoe Volioti and I were privileged to attend the premiere of Natuurpunt’s new film ‘De Nieuwe Wildernis’ at Kinepolis in Brussels. As the name ‘The New Wilderness’ suggests, the film brings the viewer to the Oostvaardersplassen, a nature reserve in the Netherlands which is less than fifty years old but is nonetheless teeming with wildlife. The reserve is home to a variety of birds including the Great Cormorant, Kingfisher and White-tailed Eagle, as well as Heck cattle, red deer and perhaps most famously, Konik horses, which were originally introduced in order to maintain a healthy balance between wetland and woodland. Although the landscape is inhabited by many introduced species, the ecosystem is thought to be similar to one that would have existed prior to human disturbance. 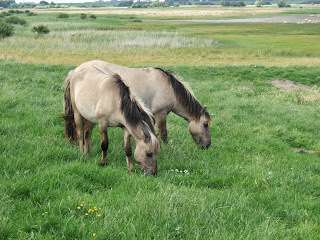 Koniks, for example, are close relatives of the Tarpan breed which became extinct after the turn of the 20th century. Without giving too much away, the film is a brilliant depiction of the circle of life and the balance between survival and death in nature. We were all really excited to see a landscape so close to home on the big screen. As a nature photographer, I was blown away by the incredible scenery and geography of the reserve. I was also impressed with the tenacity of the director and cameraman, Ruben Smit, who undoubtedly had an endless supply of patience in order to obtain such great footage. Needless to say, we all loved the film and we’re really proud to be supporting Natuurpunt as our 1% for the Planet partner. Perhaps what I found most amazing about Oostvaardersplassen is that it’s located just 30km from Amsterdam, sandwiched between Almere and Lelystad, both significant cities in their own right. It’s earned itself a place as a Ramsar wetland and is also designated a Special Protection Area and yet it’s tiny - just over 50 km². This is pretty incredible when you consider that it’s home to one of the largest herds of wild horses in Europe. If you have any interest whatsoever in nature, I’d highly recommend seeing this film, which is on for the next week at Kinepolis cinemas in Belgium. And while we nervously tweeted on Tuesday that our Dutch skills might not be good enough to watch the film, fear not - it’s also subtitled in French. In the meantime, feast your eyes on the trailer or visit the website.